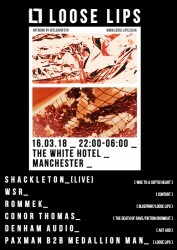 Not only is our next party at our favourite venue in the city, The White Hotel, but we’ve got one of our favourite artists and one of bass music's most mysterious figures flying over from Berlin for a very special live set. If you’ve seen Shackleton before, you know what to expect. If you’ve been to The White Hotel before, you know what to expect. 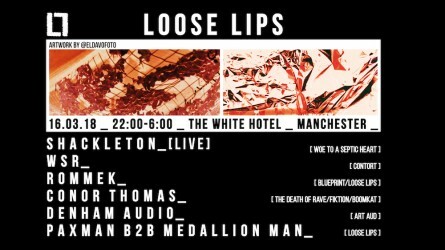 If you’ve been to a Loose Lips Party before, you know what to expect. Put all three together though and ya gunna have Kim and Aggy cleaning the gaff for weeks after. 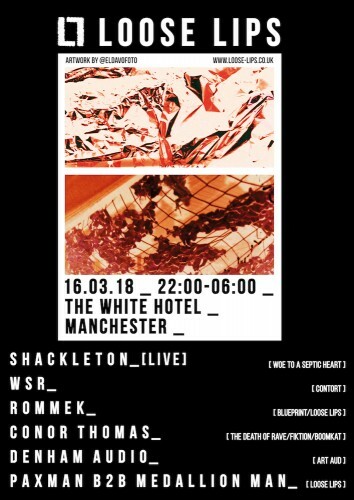 Blueprint Records/Loose Lips resident Rommek also joins us, alongside Sheffield’s up and coming bass trio Denham Audio and the incredible improvised string experiments of WSR. More residential support comes from none other than head honcho Medallion Man & Manchester resident Paxman. Full power hours, till they lock it off in the early ones. WSR first released on Contort Records and showcased on the main stage at the 2015 edition of Berlin Atonal festival. He oper­ates in the limbo between acoustic and syn­thetic music, human­is­ing elec­tronic sources while mutat­ing sounds taken from real instru­ments and envi­ron­ments, experimenting with the possi­bil­i­ties given by self-built string instru­ments and their sonic phys­i­cal­ity. D.A have had releases on Addison Groove's Groove Label as well as UK Techno producer Ejeca's imprint and have remixed and worked with a tonne of the most exciting undergroud bass acts in the scene. Their sound is best described as a mix of Jungle breaks, rave pads and heavy UK Bass.